If timing is everything in comedy, then an email I received from Danny Stack on the 17th of January this year was hilarious. I had not even been redundant for 10 days when I got an email from Danny enquiring about a web series he was thinking of doing and whether I would be interested in playing one of the characters. After a good long hard think (About 0.006 seconds) I emailed back and thus began my involvement in Liquid Lunch. 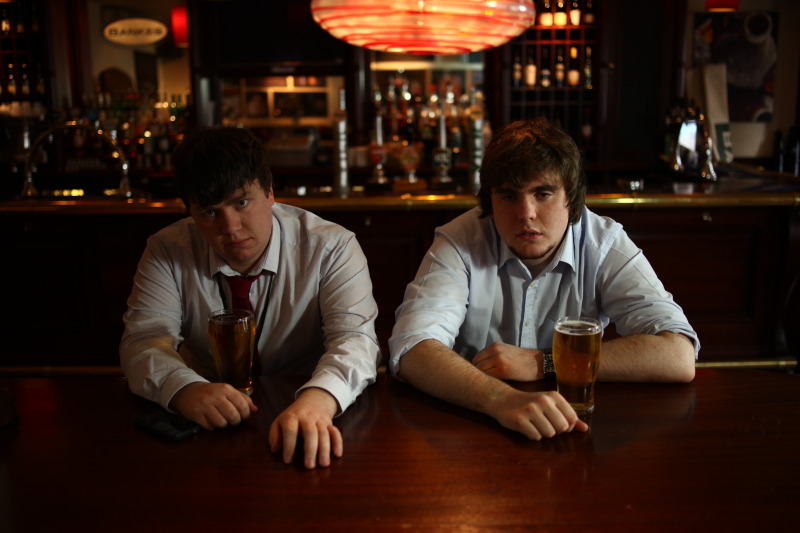 A comedy web series that follows two down trodden twenty something’s as they spend lunch every day in the same pub trying to drink some interest into the monotony of their working day. Danny had sent an early draft of episode one in one of the initial emails, it was funny and I had an instant affinity with one of the two characters, although I didn’t know who Danny had me in mind for. So I didn’t bring it up, and oddly enough, neither did he. Danny did however ask if anyone I knew would be good for/willing to be involved in the second role. I spent another fraction of a second thinking before I came to Chris Billingham, who I had worked with on the Edinburgh Fringe show "Placement Crisis". Not only did I know he could act, but he's a good friend and I knew he would be very easy to work with. Danny was happy to have Chris involed and it seemed decided. One problem I had was that I was a bit nervous I wouldn’t be able to do the script justice, I had only ever acted out of necessity and wasn’t sure Danny was aware of my potential limitations. So I suggested Chris and myself record a read through of the first script and send him the audio, to make sure he had a good idea about what he was dealing with before he decided on anything. To be honest, I didn’t want Danny to know about these doubts, so the excuse I used for us recording our own voices for a reading was that it would be “Helpful to the writing process to hear the dialogue out loud”. Danny agreed, and also mentioned that if we wanted, we were free to add improvisations to the recording. A chance that two people with their eyes on a future in screenwriting simply couldn’t turn down. So Danny got two audio files in his email a few days later, one that was word for word the script he sent us and one where we had improvised a lot of additional material. In terms of who would play who, seems fate played a small part in that decision. Without really discussing it, Chris and myself had both formed a connection to different parts and read as those parts. It turns out that Danny had imagined it this way from very early on but wanted to see how we would choose. It also turned out, that Danny liked the improvised version, and seemed perfectly happy to move forward with Chris and Myself. I arranged for us to meet Danny in London for lunch where we were treated to an unfinished version of the episode two script. It was brilliant, superior to the first in almost every way, which is saying something because I had really enjoyed the first episode. Danny gave us an overview of how the final four episodes would pan out and we went our separate ways rather excited. Over the next week Danny emailed myself and Chris a draft of episode two which we also did an improv session for. Shortly after that we received first drafts of episodes three and four. At this point Chris and I asked if we could potentially have a session together where we actually performed face to face, we explained that this would lead to alternate versions of the scripts themselves that included our improvisations. The idea being that Danny would then be able to play Dr. Frankenstein and pick and choose bits from his drafts and bits from our drafts to create a hybrid version that felt in line with his vision, but also included a little of Chris and I. So that’s what we did, we spent a rather tiring weekend looking at the scripts, rehearsing and adding where we could. We didn’t dare label any of the scripts that were the bi-product of that weekend “draft two”, that didn’t feel right, these were simply the drafts Chris and I had played with so it would be easier for Danny to decided which of our improvisations to indulge. But low and behold when Danny emailed back the new “Hybrid” versions of the first four episodes they were all labeled as “Draft 3”. Also, there was much more of Chris and I in there than I was expecting, but it was all much better somehow. Danny had found this incredible way of enhancing everything we added and blended it into his original work perfectly. Not only had he indulged our additions, he had run with them and improved them. These hybrid drafts Danny put together are quite close to what eventually became the shooting drafts. Danny came up to my place in Kingston a week or so later to record me and Chris performing the most recent drafts to a camera to give us a chance to rehearse and to give him a chance to see what did and didn’t work in practice. A truly great day of rehearsals, that proved even further, as if it were needed, the strength of the material we had. As we moved into early March Danny sent episodes 5 and 6, and like the absolute legend that he is, he sent them in final draft format and invited us to “have a play” with them. An opportunity we would not miss. Just like the first time, we didn’t consider these new drafts, we saw it as an alternate draft with our take on the material, we simply added a gag here and there and tweaked the wording of certain sentence. Danny had done such a great job executing his story it was nothing short of a pleasure to have a little fun with the material. Once we sent our take on those scripts back to him Danny once again took the best of both drafts and created a hybrid. These drafts are also very close to the shooting drafts. After one last rehearsal session with Danny in London around mid March focusing on the final two episodes, Danny sent us shooting drafts of all the script and started putting a production together while Chris and I started learning our lines. I’m sure Danny will expand on the process of making the production happen on his blog at some point, although if he wasn’t planning on doing that before, by saying that I'm forcing him too now (Sorry Danny). From my perspective it cannot have been easy arranging all the equipment, crew, cast and the location so they would all be in place and ready to shoot on the same day. But he pulled that off too, genuinely can’t speak highly enough of the man. So while Danny worked his magic I spent the next couple of weeks staring at those scripts until I got thoroughly sick of looking them (That’s how you know when to stop) in order to learn them. Danny organised the shoot for Monday the 11th of April and on the Sunday Chris and I made our way down to Bournemouth (Where this was shot) and met Danny for a final rehearsal sans scripts. This went well enough and at half five the next morning my alarm went off (Unit call was at 6:30) and we made our way to the pub where we spent the day shooting. We finished around half past two in the afternoon, exhausted but happy with our work. As you have no doubt realised, the pictures I’ve scattered through the blog are all from that day. Liquid Lunch is coming soon and will be brilliant… honest. Images are the copywrite/property of Danny Stack; do not reproduce without permission. PS: I genuinely want to thank Danny Stack for taking a chance and giving me and Chris this opportunity. He could have played it safe and brought in more experienced people. But he gave us a shot, and for that we shall be eternally grateful. PPS: Honestly Danny, I promise that will be the last time I'll thank you.